In this powerful book, Paul McGuire reveals how Bible prophecy predicts a coming one world government, one world economic system and a one world religion where the Mark of the Beast will be given to people in order for them to buy or sell. How all of this is happening before our eyes with the rise of microchip implants, nano-chip implants, virtual reality and science fiction-style surveillance technologies that are seen in movies like Minority Report, The Matrix, Total Recall, The Hunger Games and Inception. 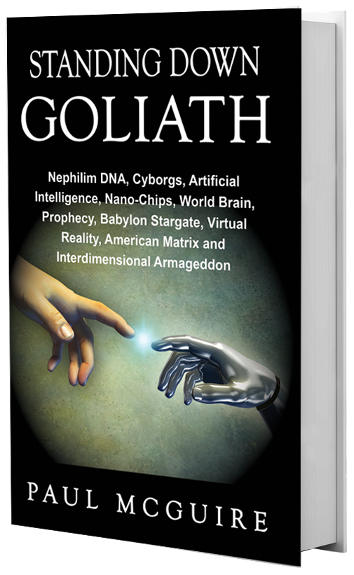 Paul provides evidence about how a scientific elite that began in Atlantis, which was documented by the philosopher Plato and later on writers like H. G. Wells, are using computer technology and genetics to develop a “World Brain” to control the masses with Super Artificial Intelligence, computer-brain interfaces, a global matrix, the Singularity and Transhumanism. Paul shows how The Tower of Babel was an interdimensional Stargate and the first one world system where occult technologies were given to mankind by the “sons of God” who mated with human women creating a hybrid race of Nephilim. How the account of Noah and the Flood is a DNA, holographic, genetic and digital event that Jesus Christ warned would return in the last days. In Standing Down Goliath you will discover how events in Russia, America, the EU, Ukraine, Syria, Iran, Israel and China are fulfilling the prophecies of Daniel, Ezekiel, the Apostle Paul and Jesus Christ. It explains how the Bible predicts the final space based war called Armageddon along with the Ezekiel 38 conflict. This book reveals the plan to destroy the U.S. dollar and bring in a world currency. Paul exposes that the coming global crisis is about to happen that will change Earth and a coming invasion of Israel by the nations of the world who will be defeated. Know how the power of prayer and evangelism can transform nations!